With over 50 years of tradition, the Darlington Canoe Festival is one of the premier summer events in Southwest Wisconsin, welcoming residents from all over the nation to an annual community celebration. 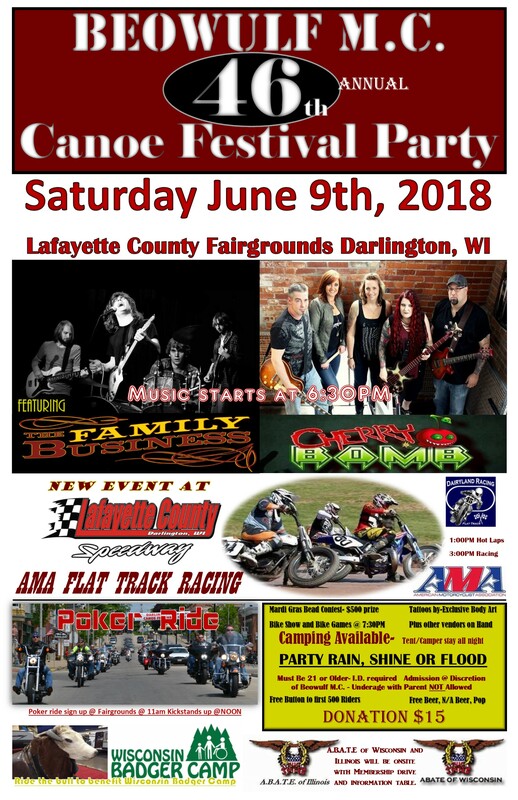 The Darlington Canoe Festival, dubbed a community homecoming by most, offers a great opportunity for current Darlington residents, past Darlington residents, and visitors to gather and celebrate community, family, and friends in Darlington's historic downtown business district along the banks of the Pecatonica River. This four day festival has activities for people of all ages including Little League and softball tournaments, stock car races, 2 and 5 mile road runs, Beowulf motorcycle summer party, talent show, fireworks and, of course, the canoe race on the Pecatonica River. It also includes an arts & crafts fair, carnival, a parade, and much more! Explore these links to learn more and then come explore the Darlington Canoe Festival! Thursday night: ALL NEW! Three on a Tree! Friday night: All the way from Nashville - JAKE DODDS! Saturday night: Fireworks & Beowulf Party. Sunday: Big Parade & UW Marching Band. Full Schedule of Events - Coming Soon! All New Carnival in 2019! All New Family Events Coming in 2019!